Nigerian taximobile app service, Easy Taxi, has partnered with Samsung Nigeria to integrate its service into devices brought into the country. Launched in Brazil two years ago by German technology startup incubator Rocket Internet, Easy taxi app allows seamless connection between taxi drivers and passengers in the best possible way. A statement released by the company confirmed that Samsung has been granted a licence to distribute the Easy Taxi application on its devices, 30,000 of which will be pre-loaded with the Easy Taxi application for free downloads on the Samsung App Store. The app has previously been available on iOS, Android and the new BlackBerry devices. The move is in line with the brand’s mission of positioning itself as the easiest, safest, most convenient and most accessible taxi hiring service in the country, Easy Taxi Managing Director, Mr. Bankole Cardoso said. “I am extremely excited about this partnership with Samsung. Samsung is the leading provider of smartphones in Nigeria and Easy Taxi aims to become the leading smartphone application in Nigeria; so, we are confident that this partnership will be beneficial for both parties,” he added. 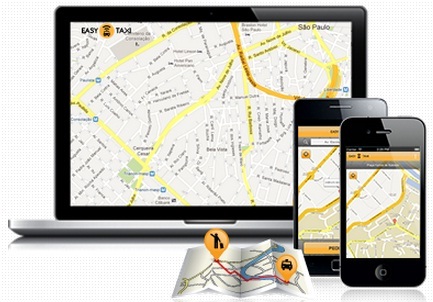 Easy Taxi has been launched in 15 markets throughout Latin America, Africa and Asia with over 2 million downloads and 60,000 drivers in its network. The app allow users to get information within seconds on the name, photo and car model/plate of the specific driver, and to follow the vehicle’s location in real-time as it approaches them. “By now, the app has over 1.5-million downloads and more than 45,000 taxi drivers in the network. We want to bring this success to other attractive markets and we see high potential in many Asian and African countries,” the head of International Expansion of Easy Taxi, Dennis Wang said as at July 2013. However, concerns over price negotiability is an issue. “Easy Taxi is full fledged app offering more options compared to other competitors, however, one cannot really negotiate a price before the taxi arrives,” Nigerian tech journalist, Jesse Oguntimehin says. “Easy Taxi’s partnership with Samsung Nigeria is a “win-win” arrangement in terms of awareness and reach, as the app will get more exposure to middle class and high earning individuals who patronize Samsung smartphones,” he added. On launching in Nigeria; the company said it plans to launch the app in other African companies including Ghana, Egypt, Morocco, Ivory Coast and South Africa towards the end of the year.